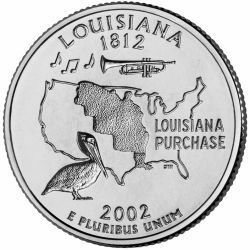 Louisiana State Quarters are the 18th variety in a series of fifty design changes over a ten year period from 1999 to 2008. This Quarter was released into circulation on May 20, 2002. The reverse of the Louisiana Quarter shows an outline of the lower 48 states along with a textured area representing the land of the Louisiana Purchase. This land was acquired by President Thomas Jefferson in 1803 for the nominal amount of 15 million dollars. That equates to approximately 3 cents per acre! The reverse of the quarter also has a trumpet that symbolizes the tradition of jazz in New Orleans. Lastly, it shows a Pelican as Louisiana's state bird. The reverse of the coin bears the inscriptions "LOUISIANA 1812", "LOUISIANA PURCHASE", and "E PLURIBUS UNUM" along with the date of 2002.